Your restaurant food menu, when designed well, can be so much more than just a list of items which you offer at your restaurant. Your food menu, in fact, is the biggest tool in your arsenal which you can use to gather high profits. Menu designers design menus with a specific level of marketability in mind to ensure certain dishes sell. The restaurant industry is a competitive market. Tourism is high, customer count is high however so is the rivalry. What is Food Menu Designing? Keeping that into perspective it is interesting to note that high levels of competition which subsequently brings down restaurant profits are an issue everywhere. Thus comes the role of a food menu. Food menu designing is the art of designing a restaurant menu so that the selected dishes have the highest selling rate in order to increase the overall sales of the restaurant. It includes a variety of techniques which must be combined and used together with the end goal to elevate customer experience, increase sales, decrease or increase table turnover time, push the customer to order the right dishes etc with the end goal to earn the highest profit possible, all through menu design. Food menu designing is different from food menu engineering on the grounds that the latter includes pricing the menu and only structuring it for higher profitability. 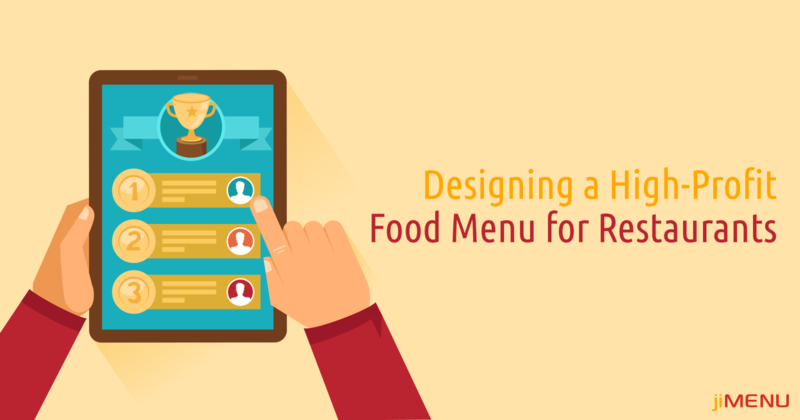 Why Food Menu Designing is Important for Your Restaurant? Food menu design is a vital part of your restaurant marketing operations. Your menu is the CV of your restaurant and not having a well-designed menu would imply that you are falling flat at the core of your restaurant marketing strategy. This is so on the grounds that regardless of who the diner is, he/she will glance through your menu and choose what they want to eat. This implies that your food menu is the primary factor that impacts what your customers order and how much. The whole purpose of food menu design is to garner the highest possible profits and those will come only from the sale of the right dishes. Menu designing is an effort towards pushing the customers to order only the highest profit dishes in a restaurant with the goal that high profit generating dishes are sold as much as possible and least number of clients default to the basic dishes. How the items are placed, where they are placed, how many are placed, what text style is used, what spacing is used, how the price is hidden are all the factors working together to upsell the right dishes. The restaurant industry is an especially tough nut to crack, and restaurant menus, however, may appear to be somewhat irrelevant when compared with the various zones you need to pay attention to, must not be underestimated. Follow these menu design tips to make a restaurant food menu that will earn more sales and increase your profit!